Business Law, Mergers and Acquisitions, Real Estate, Wills and more. PSH Law In Cambridge, Ontario - Specializing in Wills and Estate Planning, Real Estate, Business and Corporate, Litigation Law. Our practice is built on hard work...but also on integrity, decency, compassion, wisdom, courage, innovation, and idealism. When we practice law this way we benefit not only ourselves, but more importantly, you. Bob Pettitt and Bill Schwarz studied at McMaster University (Bob) and at the University of Western Ontario (Bill), and later met at the University of Toronto Law Faculty where we each graduated with a Doctor of Jurisprudence. In 1967, one year after graduating, Bob married Gail and Bill married Nancy. Bob and Bill articled with two prestigious Bay Street law firms (Bill at the firm of Gardiner Roberts and Bob at the firm of White, Bristol) where they received a solid grounding in the fundamentals of the practice of law. They were both invited back to practice at their respective firms and worked there for about two years. In 1969, after exhaustive research as to the best communities within an hour of Toronto, they chose Galt, Preston and Hespeler in which to locate. The towns had a feeling of community, akin to their origins of Regina (Bill) and Hamilton (Bob). On September 1, 2009, Bob and Bill welcomed Carly Hills as an associate. Carly studied at York University and went to law school at the University of New Brunswick. She completed her articles in Bracebridge and was called to the Bar in 2007. She went on to practice at a firm in Simcoe but is now happy to call Cambridge home. Carly has rapidly become a member of the Cambridge community and is only too happy to accept new clients and referrals. On January 1, 2010, Carly became a partner in PSH Lawyers and on January 7, 2015, we celebrated the 45th anniversary of the founding of our firm. On December 31, 2012 Bob retired from the practice. Although Bob no longer advises clients he is still very much a part of our team. On November 17, 2014, we welcomed Michael Pass as an associate. Michael studied at McMaster University and went to law school at Queen's University. 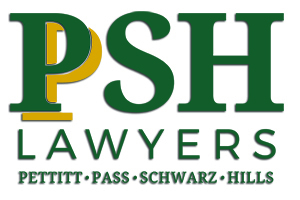 He completed his articles and practiced at a firm in Simcoe for three years prior to joining PSH Lawyers. Michael increases our level of expertise in the area of civil litigation in addition to his knowledge of our existing areas of practice: real estate, municipal law, corporate law, estate planning and estate administration. Forty five years brings a lot of change. We are proud of the fact that we are able to maintain a sense of history and, at the same time, incorporate an avalanche of new technology. The precept on which we built our practice, and by which we continue to enhance and cultivate it, is our commitment to have a relationship with our clients. We have always tried to be a "relationship" firm rather then a "transactional" firm. What we mean is that we try very hard to be all things to you! This may sound strange in our day and age of specialization but that is the reason for our success. We don't only want to act for you in a single transaction; we want to represent your business, do your estate planning, act for you when you buy or sell your home; help you in difficult times... and all of the other necessary times you need a lawyer. When we have a relationship with you we are aware, not only of your need, but also of your expectation. Our commitment in our relationship with you is that we will only do first class work, sensitive and responsive to your requirements. If we can't do the work ourselves, [and that does occasionally happen], we will only refer you to someone who is as competent in their field as we are in ours. Newsletter 4 - The Story Continues.../Should You Incorporate?